Our tarts are an upscale alternative to the traditional pies. In addition, our fruit-topped flans are a luscious alternative to our cake and pastry offerings. Our Pies are made with shortcrust dough in 9" angled pans and filled with flavorful fruits, nuts, custard, or lucious cream. Slices of apples and raisins spiced with cinnamon are baked until the crust is flaky and golden brown. Apple cinnamon compote baked in a flaky shell and topped with buttered crumbs. Vanilla custard is baked inside a pie shell until the custard top is golden brown. A flaky pie shell is filled with ripe banana custard and decorated with swirls of fresh whipped cream and chopped walnuts. This pie is filled with a sweet blueberry filling and baked until the crust is golden brown. A sweet cherry pie filling is baked until the crust turns a caramel brown color. Silky chocolate mousse fills this pie shell centered with chocolate shavings and garnished with fluffy whipped cream rosettes. Coconut custard fills the flaky pie shell and topped with fluffy whipped cream and coconut shavings. Fresh key lime juice gives this pie a citrus punch. This pie is then decorated with airy whipped cream rosettes. A pie shell filled with lemon curd and topped with light and fluffy meringue swirls, torched until a caramelized golden brown. Instead of being covered by a pastry crust, this pie consists of baked peach slices covered with buttery crumbs. Honey-glazed pecans fill this chewy, golden brown pie. Experience the complex flavors of caramel, vanilla, and the rich deep flavoring of roasted nuts. A Thanksgiving tradition, our pumpkin pie is made from pumpkin puree and spices. A perfect dessert on a cool autumn night, our sweet potato pie is made from sweet potato puree and baked in a pie shell. Our Tarts are made with pate sucree in a 9" straight edge pan. Slices of apples are baked in frangipane and custard cream and then drizzled with caramel sauce. This bright and fresh tasting lemon custard is baked in a sweet tart shell until just set. Rich dark chocolate fill this baked tart shell and then decorated with ganache rosettes. A delicious layer of peanut butter lines the bottom of this rich chocolate ganache-filled tart and decorate with peanut brittle. A favorite autumn dessert, stewed cranberries line the bottom of this tart, which perfectly balances the caramelized, crunchy walnut filling. Slices of fresh apples are artfully arranged in frangipane and custard cream and topped with cinnamon sugar. Sweet dark cherries layered on top of frangipane and vanilla custard cream in a tart shell. Ripe peach slices baked in frangipane and vanilla custard cream inside of a tart shell. Slices of juicy pears are decoratively baked in frangipane and vanilla cream. Seasonal fresh fruit artfully layered and baked in brown butter and almond paste with powdered sugar sprinkled on top. Seasonal berries such as strawberries, raspberries, and blackberries are beautifully arranged in a tart shell filled with rich dark chocolate ganache. Fresh fruits are arranged on top of vanilla custard in buttery tart shells. An alternative to Key Lime Pie, this tart is lined with a cream cheese filling and key lime curd is layered on top. A sweet tart shell lined with a cream cheese filling and then topped with lemon curd. A tart shell filled with lemon curd and topped with light and fluffy meringue swirls, torched until a caramelized golden brown. 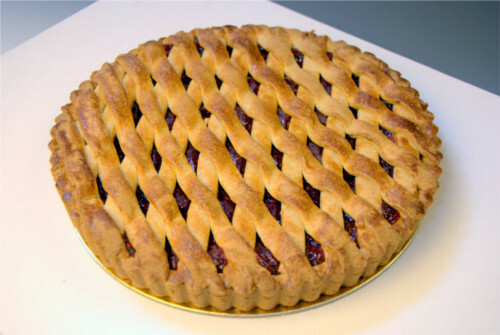 An Austrian dessert made from raspberry preserves is lined and covered with a flaky, tender hazelnut lattice pastry. Powder sugar is then sprinkled on top. A combination of macadamia nuts, cherries, and shredded coconut gives this tart a distinctive flavor and texture. A popular dessert during the holidays, honey-glazed pecans fill this chewy, golden brown tart. A fruity tart filled with slices of rhubarb and strawberries and topped with powdered sugar. Whole sliced apples are baked in a tall pastry shell with rich creamy vanilla custard. Baked in a tall pastry shell, this creamy vanilla custard is topped with warm caramel. This flan is baked in a tall pastry shell with shredded coconuts that enriches the vanilla coconut cream custard filling. Mixed berries are baked into a tall pastry shell with creamy vanilla custard. Tart passion fruit puree balances the sweet, rich flavor of the creamy vanilla custard that is baked in a tall pastry shell. Sliced peaches are baked in a tall pastry shell with creamy vanilla custard. Sliced tender pears are baked in a tall pastry shell with creamy vanilla custard. A popular Spanish dessert, our flan is baked in a tall pastry shell with a rich custard made with vanilla, eggs, and cream.